being the master-mind behind this sweet deliciousness! Preheat the oven to 350F. If using cupcake wrappers, fill cupcake trays with 18 liners. Combine the flour, salt, baking powder and cinnamon in a medium bowl. In a large mixer bowl, cream the butter and sugar at a medium speed until light and fluffy (about 2 minutes). Add the eggs and vanilla to the mixer bowl one at a time until well combined. Add ⅓ of the dry ingredients to the mixer bowl, then alternate with half the milk, repeating until all of the milk and dry ingredients are incorporated. Spoon the batter in to the cupcake tray (I like to use an ice cream scoop) until each is ¾ full. Bake at 350F until cooked through and a toothpick comes out clean (about 15-20 minutes). Remove the cupcakes from the trays and let cool before frosting. 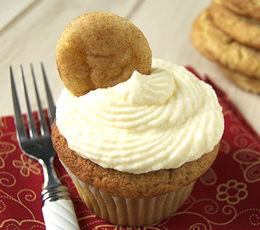 Garnish with one miniature snickerdoodle before serving.